I invite you to be present for the Annual Family Meeting of the Florida Baptist Convention. The Pastors Conference and other Fellowship Meetings will occur on Sunday and Monday. The Florida Baptist Convention will begin on Monday evening and conclude on Tuesday evening. Your presence and participation are important because you are part of the family. I am grateful for the effective leadership of Dr. Stephen Rummage, Senior Pastor of Bell Shoals Baptist Church, the President of the Florida Baptist Convention. Dr. Rummage, in conjunction with the Committee on Order of Business, has prayerfully prepared a very exciting and well-planned Convention. I ask that you pray for a powerful moving of the Lord through the events of our Family Gathering. The theme of the Convention is FAITHFUL. We will be challenged in various ways to be FAITHFUL to our Lord. Pastor Erik Cummings has developed the Pastors Conference under the theme of CONTEND. The Conference will focus on this important issue for our churches as we seek to impact Florida and the world with the Gospel of Jesus Christ. 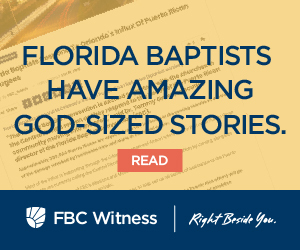 You can find information related to the Florida Baptist Convention Annual Family Gathering at https://flbaptist.org/annual-meeting/. I am looking forward to seeing you in Miami and hearing a Word from the Lord for our Florida Baptist Family! An Alabama native, Tommy Green holds doctor of theology and master of divinity degrees from New Orleans Baptist Theological Seminary and an undergraduate degree from Samford University in Birmingham, Alabama. As the 10th executive director of the Florida Baptist Convention, Dr. Green leads the 1-million-member Florida Baptist State Convention.